Seriously, just like Seon Yu has given out many opportunities to her enemies, so has Ji Seok. He’s also giving his wife opportunities to turn to him and trust in him to share whatever burden it is that she is carrying. How’s that working for him so far? And not he isn’t the only one noticing Seon Yu’s downward spiraling moods, so has Mrs. Gong. She wants her granddaughter-in-law to trust in her as well. This, of course makes Seon Yu all the more distraught for her lies…mostly of omission. So Hyeonsu doesn’t believe Seon Yu will make good on her threat to turn the pictures over to her husband. Guess again! Seon Yu had her dongsaeng on standby to drop off the pictures as a messenger to Ji Seok’s office. Not knowing the truth, Hyeonsu thinks she’s just bluffing, but she warns him she gave him a chance and this is his choice before walking away. Hyeonsu becomes a bit uneasy at this. 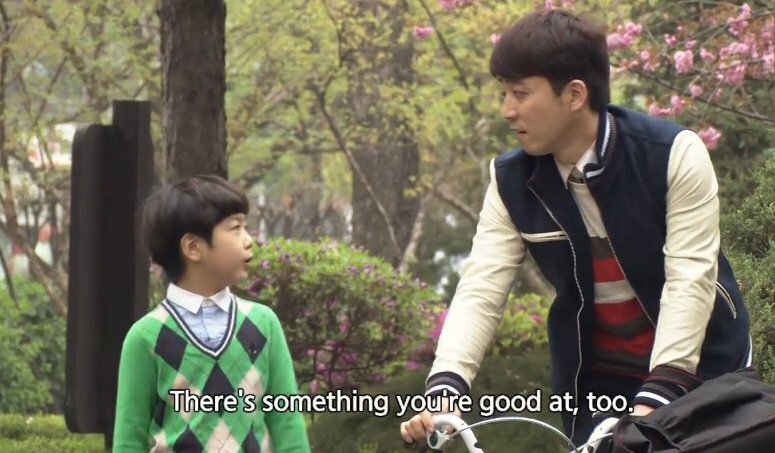 What is amazing is how he insists that Tae Jeong will do right be him no matter what. WHY does he have such faith in that evil, cold blooded man? BIG mistake. Seon Yu already know this and tries to warn others, but Ji Hui and Hyeonsu remain in their own delusions about Tae Jeong each for their own reasons. So Ji Seok sees the pictures of Tae Jeong and Hyeonsu and is livid. He storms to his brother-in-law’s office and angrily tells Tae Jeong that he t old him to stay out of his office and not take anything again. Tae Jeong is clueless. Say what? Okay, we all know that Tae Jeong really isn’t clueless, he’s just playing dumb. 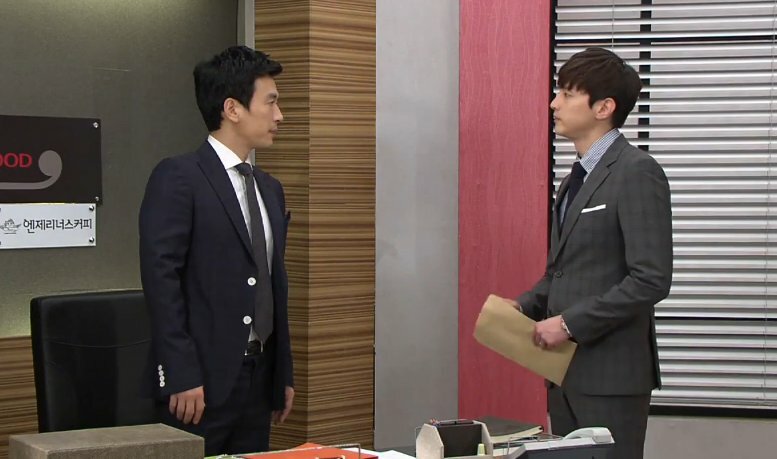 Tae Jeong asks what his sins are and Ji Seok accuses him of stealing the Nami Foods report. Tae Jeong says he has no reason to do such a thing and Ji Seok yells at him to not play dumb since Ji Seok already knows Hyeonsu is Tae Jeong’s friend. Tae Jeong can’t not admit that, but he insists over and over again that he did not pilfer the report. Ji Seok gives him the pictures that Seon Yu sent over. This shocks Tae Jeong, but doesn’t change his story. Those pictures aren’t proof of anything. Ji Seok says that you’d have to be stupid not to know money is exchanging hands. When Tae Jeong keeps going on about proof, Ji Seok does admit there wasn’t any real proof last time, but this time, the pictures are proof enough, plus there is no proof Tae Jeong is innocent like he claims either. Nice one. To add to Ji Seok’s belief in Tae Jeong’s wrongdoing, the worried Hyeonsu rushes into the office just as Ji Seok’s leaving. Innocent…right. Ji Seok may play dumb at times, but he really isn’t stupid. Ah, just like Ji Seok, Mrs. Gong sees Seon Yu’s low spirits and wants her now-beloved granddaughter-in-law to see her as her real grandmother and trust in her. Seon Yu breaks into tears and Mrs. Gong sends her upstairs to rest. Upstairs, Seon Yu learns that Emma still hasn’t found anything yet. To go with our heavier part of the drama, we must needs have some cuteness. We get Ji Seok seeing the depressed Seon Yu the next morning and making her tie his tie so that she claims him as hers as she’s his woman now, too. Not the most impressive scene between our couple, but it’s nice how they show Ji Seok’s affection and care. The main source of cuteness comes from Wu Hyeon. He calls up Bong Chang who is crazy busy since Pung Ho left to search for Sarang and Gi Jin is nowhere in sight helping Seon Yu out with her revenge against Tae Jeong. Chang assures samchon that Bangtong doesn’t hate Wu Hyeon one bit and really loves the bicycle Wu Hyeon bought. This cheers uri samchon considerably. He then rushes off to help Chang by delivering pizzas in Gi Jin’s and Pung Ho’s stead. Coming back from one delivery, he spies Bangtong in the park trying and failing to ride the bike. Wu Hyeon is touched that Bangtong is calling him Mr. Big Eyes again. The boy mutters that is who Wu Hyeon has always been. Wu Hyeon then grabs the back of the bike seat and holds it steady for the little boy. Wu Hyeon then lets go after a brief time and Bangtong is so shocked at first he yells at Wu Hyeon for letting go. Of course, Bangtong isn’t 100% mad as he is riding the bike on his own now. Wu Hyeon is like an excited kid and a proud dad all at once. Kawaii. On their way back to the pizza parlro, Wu Hyeon can’t stop complimenting Bangtong on his aptitude and intelligence. Bangtong shockingly comes back with his OWN compliments for Wu Hyeon. He tells uri samchon that he’s good at making deliveries. This makes Wu Hyeon very happy that Bangtong said that. He then has to tell the little boy how much it touched him when he was thanked making his latest delivery. Ah. Enjoying the father-son-like bonding moments here. We all know that under his brattiness towards Wu Hyeon, he does like the man. So what choice does Hyeonsu make? Gi Jin overhears Hyeonsu putting in a call to Tae Jeong. Looks like the idiot decided Tae Jeong would be more generous than Seon Yu when it comes to the evidence. Gi Jin calls up Seon Yu to tell her about the appointment and she rushes there and watches Tae Jeong while Gi Jin follows Hyeonsu. Truthfully, a bad move. As soon as Gi Jin knew Hyeonsu has the evidence and was heading to Tae Jeong, he should have jumped the older man to get the proof that Tae Jeong lied about his whereabouts at the time of Jin Yu’s death. Hyeonsu catches Gi Jin stalking him and manages to elude him only to be kidnapped by Tae Jeong’s hired thugs. Over and hour passes and Gi Jin says he lost Hyeonsu. Tae Jeong leaves and Seon Yu confronts him. Tae Jeong boasts about how she is his witness to his innocence in Hyeonsu’s disappearance. Seon Yu is devastated that she fell into the trap. So what was the proof anyways? It was a CD that had evidence I guess that Hyeonsu was actually on Jeju or something like that when Jin Yu died, so there was no way he was with Tae Jeong that night. Aran is on the adoption bandwagon now. Ji Hui isn’t. She just isn’t sure she can love a child right now. But she still follows her mother to the orphanage the foundation supports where there is a baby boy brought in who had been recently abandoned (by very rich people). Ji Hui sees something in the baby’s things (I think it is Jin Yu’s ring, but I might be wrong because we don’t actually see the object). At the same time, Emma has called Seon Yu. There is a boy born on January 14th with a note saying someone would be coming back for him. Seon Yu arrives and Emma comments on how the baby looks just like Jin Yu. So…WHICH baby is the right one? We will have to stay tuned and find out. Personally, I hope it’s the cute little baby Seon Yu found versus Ji Hui. I’d hate to see her do anything bad to baby Sarang because she knows it’s Jin Yu’s baby. Dal Nyeo kept referencing bringing her grandson back when she was with Aran. HOW can Aran not get it that Tae Jeong has a kid already? Sooo many hints and she knew about the pregnant Jin Yu as well. Tsk, tsk. And what was with Dal Nyeo’s shamelessly begging Pung Ho to search for Sarang together. Pung Ho isn’t an idiot. He knows that Dal Nyeo find the child is bad and means he will never get to see Jin Yu’s son. Kudos to him for washing his hands of the woman he used to protect. She is NOT worth wasting breath or time on. Breathe deep! The calm before the s**t storm next week. I will look forward to your barb and cursing!!!!! Let’s just say the 80’s are REALLY interesting!!! I throw barbs and curse? Not me…whistles innocently. I know something “fun” is coming. Only a few more days to start finding out. Aigoo! My patience with Seonyu is just going. Why doesn’t she just confide all her heart ot JiSeok? And of course now we know that HyeonSu is noo more. Gone, defunct! TaeJeong is now heading toward becoming a mass murderer. Thanks for the recap.